Old Moulton Texas, the Queen of the Prairies. 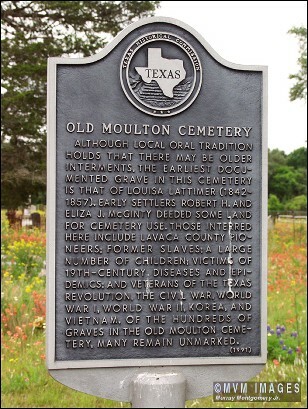 In his book, The History of Lavaca County, well-known local historian Paul C. Boethel has several pages describing some of the towns in the county, including a location known for years as Old Moulton. 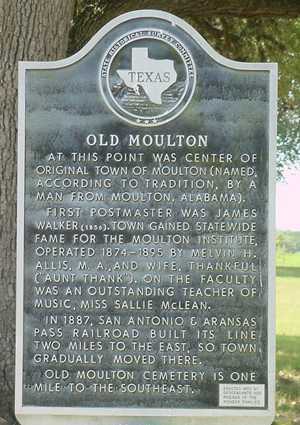 Boethel wrote that Moulton was founded before 1860 and probably sometime during the late 1850s. He also indicated that the origin of the town�s name was in doubt, with most of the early pioneers saying that the place was named for an old town in the States possibly located in Kentucky or Alabama; the latter being the most likely because it still had a town by that name. Evidently the mystery as to how the town came to be called Moulton was never really solved. In the old days there were differing opinions on the name selection. 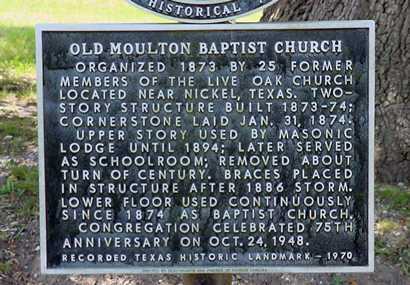 Some folks said it was named for E.L. Moulton, a pioneer settler in the area, and there were those who said it was named by a visitor who said the live oak motts were so prevalent in the region that it should be named after them � perhaps the word �mott� eventually became Moulton, no one knows for sure. Sometime before 1860, the town acquired the name �The Queen of the Prairies� because of its location in what was considered a rich prairie-land section of the county. In 1855 the Moulton post office opened and a private school operated out of a log cabin about the same time. In the 1860s school was also taught in an old Christian church. Boethel said that the town didn�t make any great progress until 1874 when Professor M.H. Allis located his school there. �The school flourished under his excellent management and direction and won state-wide recognition for the settlement,� wrote Boethel. In 1875 the community had a church, a wagon and blacksmith shop, several stores, and an Odd Fellows Hall. This was Moulton up until the late 1880s � known today as Old Moulton. Then in 1887 the San Antonio and Aransas Pass Railroad was constructed from Yoakum to Waco with the rails passing within two miles of the town and school. This greatly enhanced the economy of the community and when the railroad built a station, named Topeka, the old town gradually moved to its present location near the tracks. When most of the citizens left the old town for the new location, the station inherited the name, post office and business of Old Moulton. According to �The Handbook of Texas Online,� by the late 1890s the old site was pretty much abandoned � the community around the railroad station was now Moulton. During the 1890s significant numbers of Czechs and Germans settled in the community, and by 1896 the town had an estimated 550 citizens, a Catholic church, a public school, a hotel, cotton gins, and gristmills. By 1900 Moulton reached a population of 733, and by 1914 the town had both Lutheran and Catholic churches, a bank, an opera house, telephone service and a weekly newspaper. Since 1970 the population of Moulton has remained consistent at around 900. The census of 2000 showed the number of inhabitants at 944. The largest number of people living in the city occurred in 1980 when there were 1,009 residents. Not much remains of Old Moulton these days. The historic Baptist church being the predominate structure which has survived the years of change. 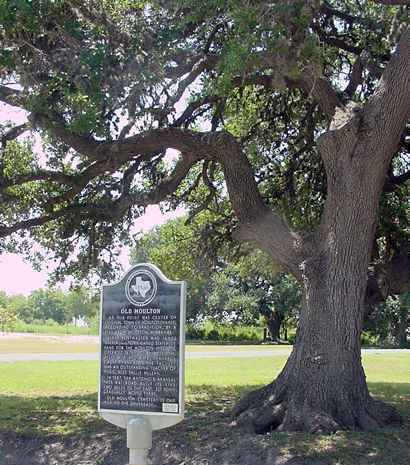 Down the road is the old cemetery, with its hallowed ground containing the remains of early pioneers � some who were involved in the Texas Revolution. Founded in the 1850s, the place once known as �The Queen of the Prairies� is one of the oldest settlements in Lavaca County and was a noteworthy contributor to the rich history of this area. At this point was center of original town of Moulton (named, according to tradition, by a man from Moulton, Alabama). First postmaster was James Walker (1856). Town gained statewide fame for the Moulton Institute operated 1874-1895 by Melvin H. Allis, M. A., and wife, Thankful ("Aunt Thank"). On the faculty was an outstanding teacher of music, Miss Sallie McLean. In 1887, San Antonio and Aransas Pass Railroad built its line two miles to the east, so town gradually moved there. Old Moulton Cemetery is one mile to the southeast. 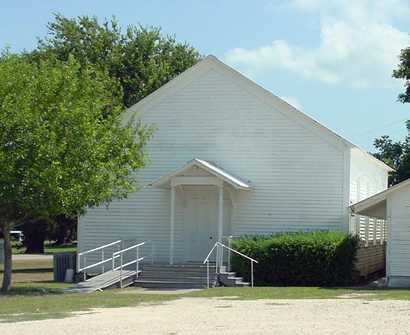 Organized 1873 by 25 former members of the Live Oak Church located near Nickel, Texas. Two-story structure built 1873-74; cornerstone laid January 31, 1874. Upper story used by Masonic Lodge until 1894; later served as schoolroom; removed about turn of century. Braces placed in structure after 1886 storm. Lower floor used continuously since 1874 as Baptist church. Congregation celebrated 75th anniversary on October 24, 1948. Although local oral tradition holds that there may be older interments, the earliest documented grave in this cemetery is that of Louisa Lattimer (1842-1857). Early settlers Robert H. and Eliza J. McGinty deeded some land for cemetery use. Those interred here include Lavaca County pioneers; former slaves; a large number of children; victims of 19th-century diseases and epidemics; and veterans of the Texas Revolution, the Civil War, World War I, World War II, Korea, and Vietnam. Of the hundreds of graves in the Old Moulton Cemetery, many remain unmarked.